3 Simple Steps To Recover Disabled Facebook Account Fast - BaseOnTechs - Learn To Do It Yourself. Is your Facebook Account blocked or disabled? Where you denied the access to your Facebook Account? And you feel there is nothing you can do to get it back? I have good news for you, letting you know it's not a permanent situation. That is to say, your Facebook Account was not blocked or disabled permanently but temporarily which means you still have access to your Account. And here right now in this post, I have given a detailed guide to help you Recover Disabled Facebook Account. No matter how long it has been disabled. Now one thing I must tell you is this. If your Facebook Account is blocked, it's for a reason. Your Account can't be blocked just like that without having anything done wrong, there must be something. Yeah, you must have tampered with Facebook terms and conditions in one way or another. So I urge you to stay away from creating a new Facebook Account with the same device, why? Because it will be blocked or disabled also in a short time. The reason is, you are using the same IP Address and it's against Facebook terms and conditions to have more than one account. If you must create a new Account, do that using a different device. PC is preferable in this case(uses different unknown IP Addresses). Like I said, your Facebook account was not permanently disabled but was disabled to verify ownership I.e to know if you are truly the one on the profile in which you are in control of. In this case, your Facebook account was disabled temporarily unless it has been stated that it's permanently disabled and inaccessible. Don't lose hope just yet, read below guides to Recover Disabled Facebook Account Easily And Fast. Now at this point, don't just get any picture from your gallery and upload. Upload your Current Profile Picture... It will help Facebook easily see to it that you're truly the one in control of your account. It is also recommended that you upload a sharp photo that shows your face clearing in order for Facebook to enable your account back. 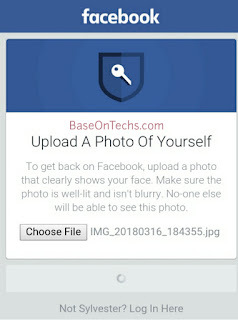 Trust me, uploading the right type of photo will help enable Facebook Account Fast. Photo format may be considered. And as Facebook knows pictures you take are mainly Jpeg format, they expect .jpg for fast approval. Make sure you upload a .jpeg/.jpg Format. Following the above correctly, you won't have to worry about method two because your Facebook Account should have been enabled by now. Kindly click on the bold text with a link which is 'Help Center'. 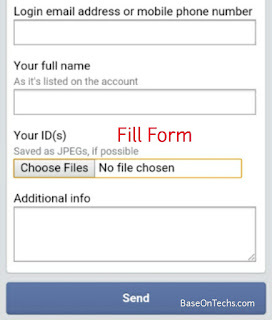 Now Facebook contact form for temporarily Disabled Facebook Account should display. 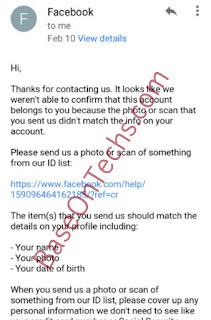 Upload Photo: Remember what I told you consigning the type of photo to upload in order for you to Recover Disabled Facebook Account Fast. Appeal: You are recommended to write an appeal to Facebook. 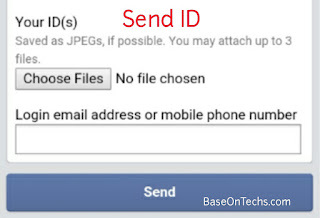 Below is how you should write your appeal in order to recover Facebook account fast. My Facebook Account Was Disabled For No Reason. Above method has helped me recover Facebook account fast than expected. If you have sent appeals more than ones and it didn't help recover facebook account due to more suspicious activities in your account. 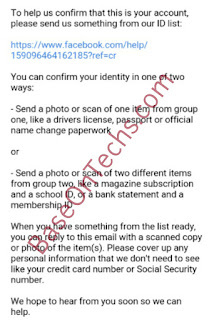 Facebook will require your ID. ID type includes International ID Card, Drivers License and other accepted valid ID's. Download Fake ID Maker: Make A Fake ID Card. Take a clear picture of your ID Card. You must make sure it displays your Country, Date of birth, First name, and Last name. You should cover other private information on the card like Address, Phone No., Issued Date, Expiry Date, and others. In fact, the ones I mentioned is OK for Facebook to open back your disabled account. Also, you can as well upload up to three(3) photos at a time for fast approval. After trying method three, if your disabled Facebook Account is not opened, check your E-mail(e.g Gmail, yahoo etc) you should receive a message from facebook. Important: The email you received was sent by a human I.e by a Facebook team member and it can be replied. 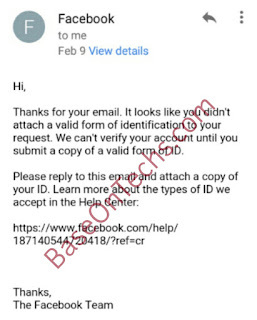 Now if you have gotten to this stage whereby you received this email from Facebook, you may ask of what right way to reply to Facebook in order to get the solution to your disabled Facebook account. This time you don't need to be calm. Ask Facebook why you Account was disabled. Even though, you violated one of Facebook terms. Tell them you are ready to resolve all issues against facebook terms in your account. And that you can't resolve them with a Disabled Facebook Account. Sending email in this sad manner will simply let Facebook understand that you really need this account and that for real you're the rightful owner. In order for the above methods to work more effectively and fast, you must make sure you don't have more than at least two(2) Facebook Account on the same phone. Instead, make use of a PC to access facebook. Why PC? Base on research and verification windows IP address is hidden. The IP address on a computer are strong, untraceable and Facebook doesn't really Disabled Account logged in mostly on Computer. Congratulations to you in advance, your Disabled Facebook Account will be back soon. Above methods helped me recover my personal Facebook Account. And so I believe yours would be recovered in a short time as well. Check out my Facebook Profile here. Make sure you read: Tips To Avoid Your Facebook Account From Getting Blocked Or Disabled.